Through ‘Slaves of Fashion,’ Amrit and Rabindra Singh discuss issues including consumerism, slavery, and the relationship between India and Britain. Contemporary issues of social, political and economic debate are handled with humour and emotion, while addressing the relationships between heritage and consumerism in the Twins’ distinctive, decorative style. Slaves of Fashion is a captivating walk-through of twenty new works from the Twins, who work locally to Liverpool while enjoying international success. The exhibition creates a meaningful journey with a clear aim of forging change in the world. The ‘past-modern’ approach of the twins has been displayed in a somewhat unexpected way from usual works by the pair. Large, impactful portraits are displayed as light boxes on entry to the exhibition, which have been produced digitally, yet still feature the decorative, colourful painting style which the twins are known for. The eleven lightbox portraits each represent a different story in relation to India’s textile industry, with a connection to the negativities of a contemporary luxury lifestyle. In the portrait titled ‘Indigo: The Colour of India’, the story of the indigo plant is told by discussing India’s history of how blue dyes were once rare and valuable, with the indigo plant being grown in demand from the British textile industry. 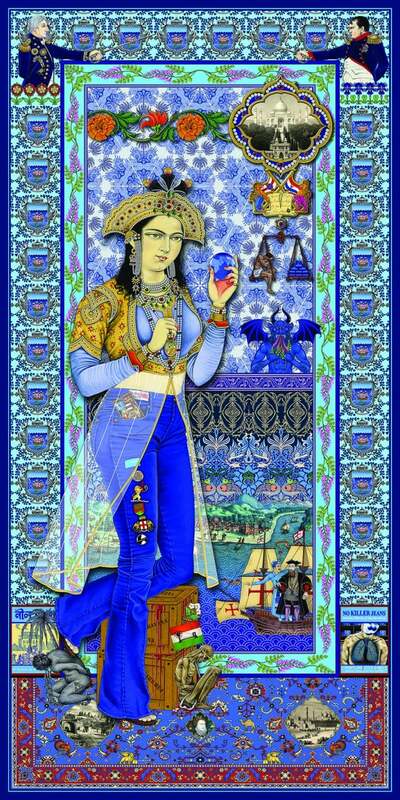 Challenging the origins of denim fabric by visually depicting the misery of Indian farmers, Queen Mumtaz (the muse of the Taj Mahal) can be uncharacteristically seen wearing a pair of blue denim jeans. The informative links in the piece allow the viewer to appreciate the 16th century Indian history of indigo farming, and the demand from the British textile industry, while creating questions to challenge the industry and the lasting effect British consumerism has had within the fashion world. Each portrait features a wide range of intricately displayed visual information, resulting in an impactful and informative experience. As well as the information in the pieces themselves, there is an abundance of extra information in relation to each portrait, including their origins, symbolic meanings, possible translations and connections to current responsibilities and debates. The link to the Twins’ intention of making a change is supported by this additional, educational information which is accessible through a variety of means. Written exhibition guides, artist statements, and a free app allow for in-depth interactions with the art work, resulting in an unavoidable connection between artwork, artists and viewer. Amongst the glow of the light box portraits, there are mixed media posters featuring more familiar faces in Western culture. 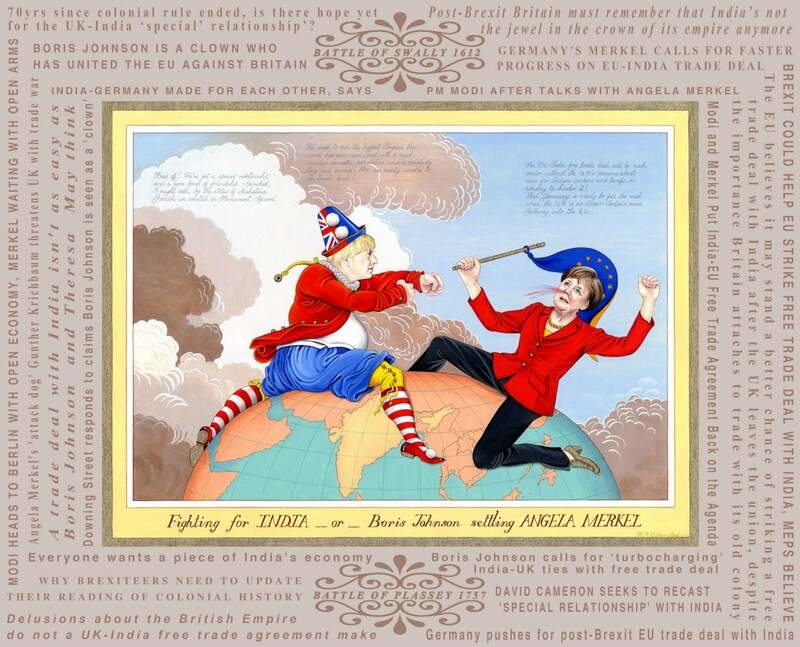 Donald Trump, Theresa May, George Bush and Tony Blair are depicted in compromising settings which have been adorned with the intricate, meticulously detailed and symbolism-rich decorative borders often found within the Singh Twins work, while referring to current and past political issues. Global consumerism features heavily throughout the exhibition, with well-known logos and slogans being used to create a connection between the everyday lives of the viewer, and the issues which the art works are based on. Once the initial impact of the lightboxes have been passed, the exhibition also features films, mixed media posters, and acknowledgements and examples of historical artefacts, art works, materials and clothing which influenced the Singh Twins’ work. Stop motion videos of the Twins creating some of the works, and interactive screens offer more in-depth insights to the themes, historical and contemporary links, and the processes which came to realise individual pieces of work. The consistent connections, relationships and visual examples of what is being discussed throughout the main space of the exhibition allow for a truly meaningful experience for the viewer. No prior knowledge is required in order to leave feeling educated, aware and passionate about the issues and history covered by the Twins, echoing their intention to make a positive change through their art work. The exhibition is a chance for viewers from all walks of life, backgrounds and stand-points to project their opinion onto the issues approached through the information provided within the exhibition. Connections between heritage and history are suggested through the different interactive and visual offerings, while still allowing space for reflection from the viewer in relation to their own experiences of Britain. The exhibition runs until 20th May 2018. All images © The Singh Twins. Contemporary issues of social, political and economic debate are handled with humour and emotion. 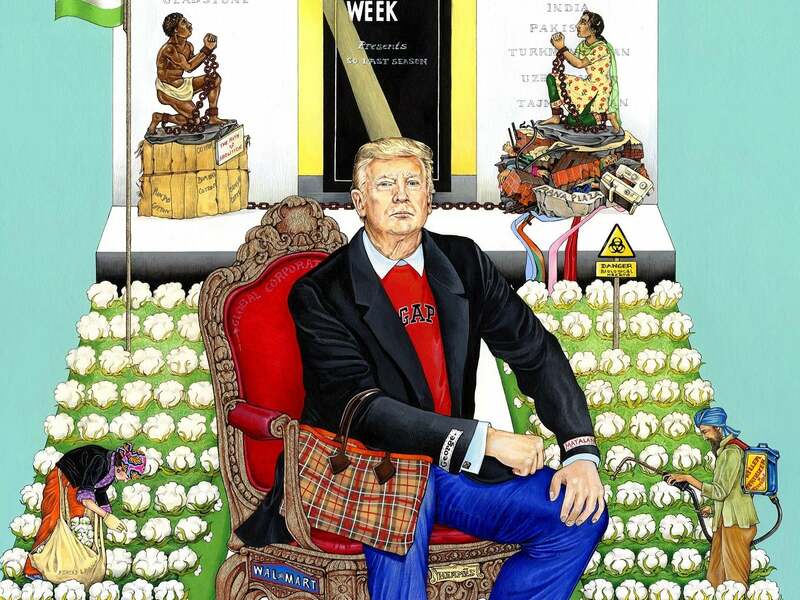 Donald Trump, Theresa May, George Bush and Tony Blair are depicted in compromising settings. Connections between heritage and history are suggested through the different interactive and visual offerings, while still allowing space for reflection from the viewer in relation to their own experiences of Britain.